Thursday morning, at a press conference at New Britain City Hall, team officials announced "Bees" as the winning selection for the team nickname of the Atlantic League's New Britain Club. In attendance were New Britain Mayor Erin Stewart, newly named Team Special Advisor Bill Dowling, Principal Owner Frank Boulton, Partner/Advisor Michael Pfaff and Atlantic League Executive Director Joe Klein. "Bees" was chosen from a final list of five, which included Stingers, Hornets, Hammer, and Hard Hitters. Winners from the public "Name the Team" fan vote were on hand as well to receive prizes, including 2016 season tickets and suites. During the press conference, two team wordmark logos were unveiled, along with team colors of gold and black. The wordmarks were designed by Skye Dillon of Skye Design Studios, a brand identity and design firm located in the greater New York City area. New Britain's nickname, the "Hardware City", is inspired by its manufacturing heritage as well as its status as home to Stanley Black & Decker, a world leading provider of tools and storage. Its motto - - "Industry fills the hive and enjoys the honey" - - is a direct reference to this robust history and inspired the new Bees' identity, beginning with the complimenting wordmarks unveiled today. The roman lettering was rendered to feel as if it were crafted from metal, bold and strong like the city. As with the script version, each letter is connected by honey, and a beehive icon has been integrated to reinforce this sense of community. A full family of marks will be released in the coming weeks. 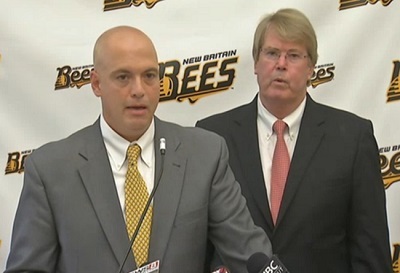 The New Britain Bees are a member of the Atlantic League of Professional Baseball and will begin play at New Britain Stadium in April of 2016. For further information, email info@nbbees.com, call 860-826-BEES (2337), or visit the newly launched nbbees.com.